For conspicuous gallantry and intrepidity at the risk of his life above and beyond the call of duty against overwhelming enemy forces at Yultong, North Korea on 22-23 April 1951. As Commanding Officer of the Tank Company, Tenth Battalion, Combat Team, Philippine Expeditionary Force to Korea. CAPTAIN YAP was executing a defensive action as an advance element of the frontline defense of the United States Army on 222300 April, when an overwhelmingly superior enemy forces assaulted the PEFTOK positions as part of the enemy’s general offensive. Upon being informed by his most advance unit that the enemy were rushing-in to overrun their hill position and that the leader of this unit FIRST LIEUTENANT JOSE M ARTIAGA was already hit. CAPTAIN YAP, determined to hold their position at all costs, reinforced the trapped unit of LIEUTENANT ARTIAGA and fought the enemy for one hour but without success. 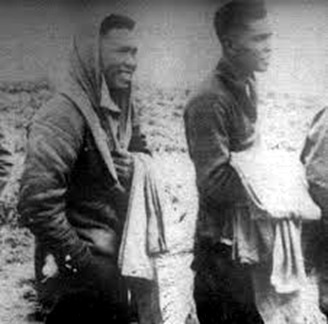 Receiving a personal report from a member of a trapped unit who succeeded in extricating himself that the enemy has already captured the position and that LIEUTENANT ARTIAGA and many others were killed, captured or wounded, CAPTAIN YAP, in a desperate effort to rescue the lost unit ordered for covering support from the other units under his command and personally led a furious counterattack to regain the hill position and rescue the trapped unit. This he did despite receiving an authority to withdraw. He succeeded in recovering the body of LIEUTENANT ARTIAGA and that of three (3) other enlisted men when. Not satisfied with this and acting above and beyond the call of duty, he proceeded to assault an enemy emplacement about 300 yards away despite the hail of enemy fires until he fell dead from an enemy bullet. His extraordinary heroism, indomitable courage, calmness and decisiveness won for him and the entire Tenth Battalion Combat Team praises by other allied nations soldiers with whom they are fighting side by side in Korea, and will inevitably form a part of the glorious traditions of our Armed Forces. The President of the United States takes pride in presenting the Distinguished Service Cross (Posthumously) to Jose M. Artiaga, Jr., First Lieutenant, Army of the Philippines, for extraordinary heroism in connection with military operations against an armed enemy of the United Nations while serving with the Tenth Battalion Combat Team, Philippine Expeditionary force to Korea, in action against enemy forces at Yultong, Korea on 22 and 23 April 1951. Throughout the night his platoon was repeatedly assaulted by a fanatical and numerically superior hostile force of Chinese Communists. With utter disregard for his safety and constantly exposed to heavy machine-gun, mortar, and artillery fire, Lieutenant Artiaga moved about the sector held by his men to steady, encourage, and deploy them to insure the best defense of their positions. Despite exhaustion, isolation from other elements of the company, and the disaster which seemed imminent, his troops tenaciously repulsed repeated attacks and inflicted numerous casualties. While tirelessly directing the fire of his depleted force, he was mortally wounded, but his courage and indomitable fighting spirit so imbued his troops with a spirit of irrepressible determination that they held the positions until relief arrived. 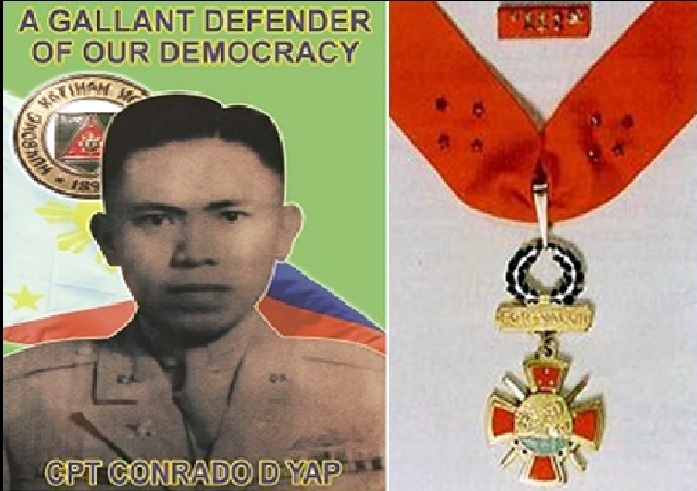 The President of the United States takes pride in presenting the Distinguished Service Cross (Posthumously) to Conrado D. Yap, Captain, Army of the Philippines, for extraordinary heroism in connection with military operations against an armed enemy of the United Nations while serving with the Tenth Battalion Combat Team, Philippine Expeditionary force to Korea, in action against enemy forces at Yuctong, Korea on 22 and 23 April 1951. Shortly before midnight on 22 April 1951, his company, occupying defensive positions, came under a vicious hostile attack which seriously penetrated the perimeter. Exploiting the breach, the enemy launched successive, determined assaults throughout the night. Constantly exposed to machine- gun, mortar, and artillery fire, Captain Yap crawled from foxhole to foxhole, steadying his men and encouraging them to hold firm. Learning that his First Platoon had been overrun, and despite orders from his battalion commander to withdraw his unit, he fearlessly led a daring charge in a determined effort to reach the beleaguered platoon. Overwhelming enemy strength and heavy fire received from flanks and to the front notwithstanding, they relentlessly pressed the assault, regained the hill, evacuated the casualties, and rescued the isolated unit. Observing a stricken soldier on the slope of the hill, Captain Yap immediately started toward the man but was mortally wounded by a burst of enemy fire. Inspired by his heroic conduct, his men continued the fight with such determination and skill that the enemy attack was contained and numerous casualties were inflicted.